Have you ever had crafty inspiration when you are out enjoying nature? Last week I was visiting Aspen, Colorado and was awe struck with the gorgeous sight of the aspen trees with their bright yellow fall colored leaves. It inspired me to create this beautiful paper aspen tree art project that is perfect for the fall season. 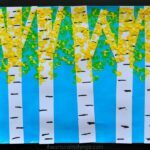 The way the aspen trees pop off the blue background gives this art project some fabulous dimension. These are sure to look gorgeous hung up on display for a fall art project. 1. 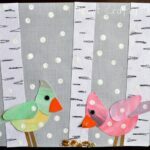 Begin by cutting three pieces of white construction paper to the size of 11-inches by 3-inches. Now make your aspen tree trunks. To do this, place a pencil at the end of the white rectangle. The shape of the pencil helps you roll the paper around to create a cylinder shape trunk. Continue rolling the construction paper up. 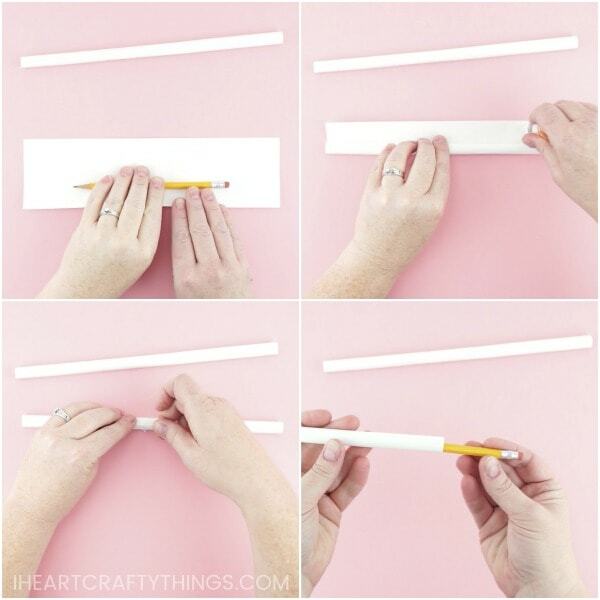 When you reach the end, add a line of glue stick to the end of the paper and continue rolling up the paper. 2. Add a small piece of clear tape in the middle of the tree trunk along the seam. Then add a piece of tape at each end of the tree trunk along the seam. 3. Tip the aspen tree trunk down to remove the pencil. 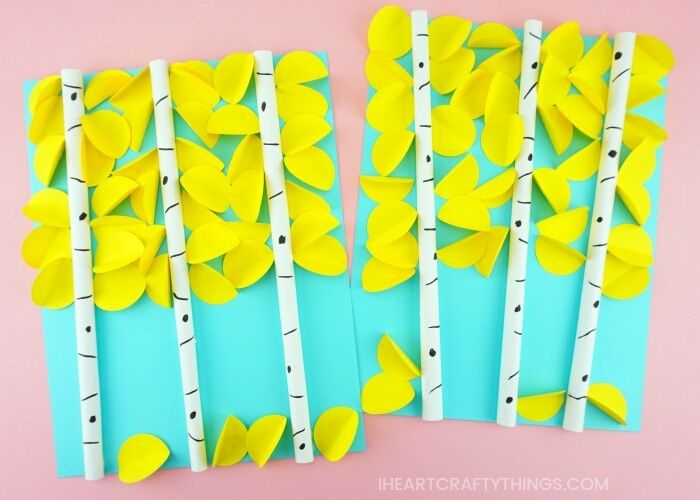 Now make two more aspen tree trunks with your construction paper pieces. 4. Use a black marker to draw bark lines and knots along the front of your aspen tree trunks. 5. 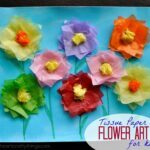 Add a line of tacky glue along the back of each of the tree trunks (along the seam) and glue them onto your blue cardstock paper. 6. 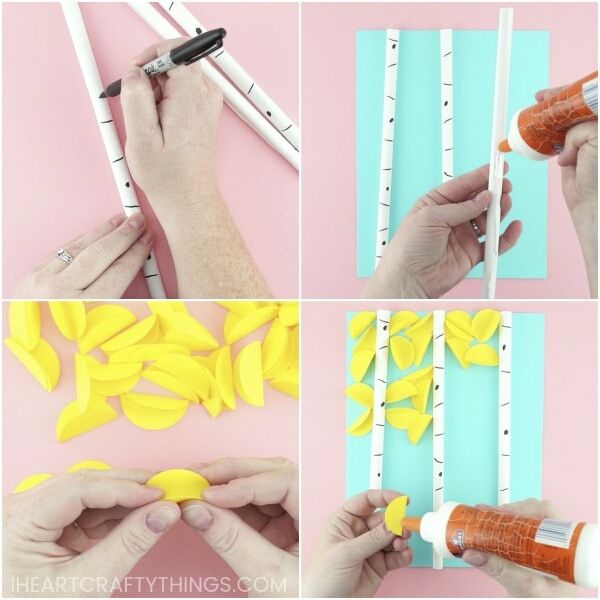 Grab your 1 1/2-inch circle punch and use it to cut out about 40 yellow circles. You might end up using a little more or less. 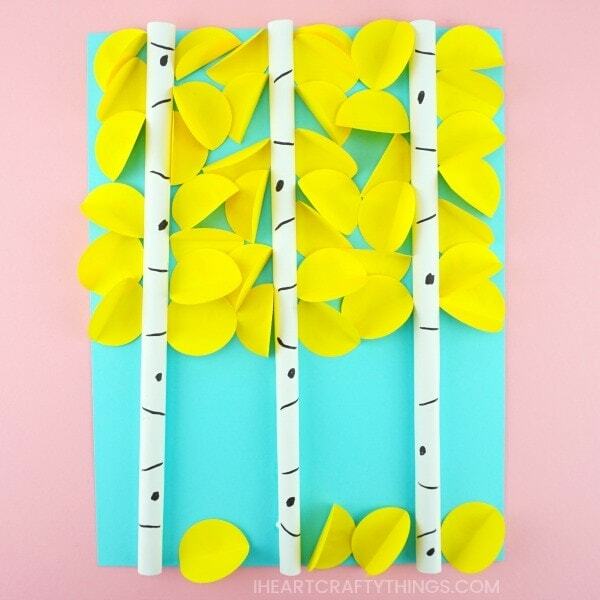 Fold each of the circles in half to give your aspen leaves some extra dimension. 7. 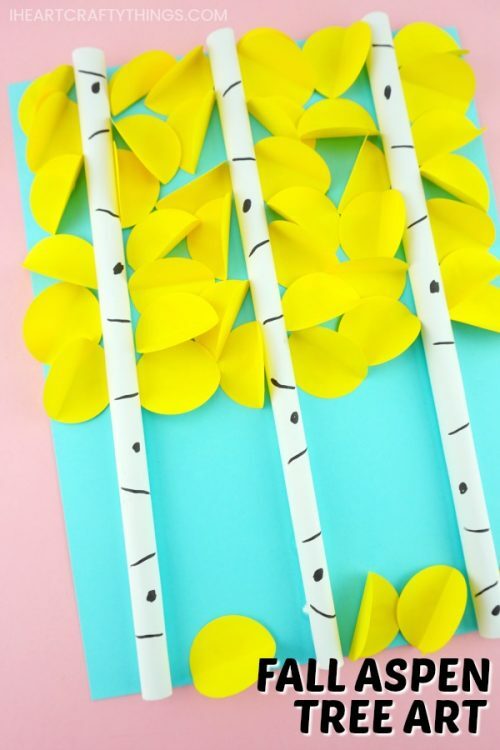 Add tacky glue or glue stick to the back of each of your yellow circle leaves and glue them around each of your aspen tree trunks. 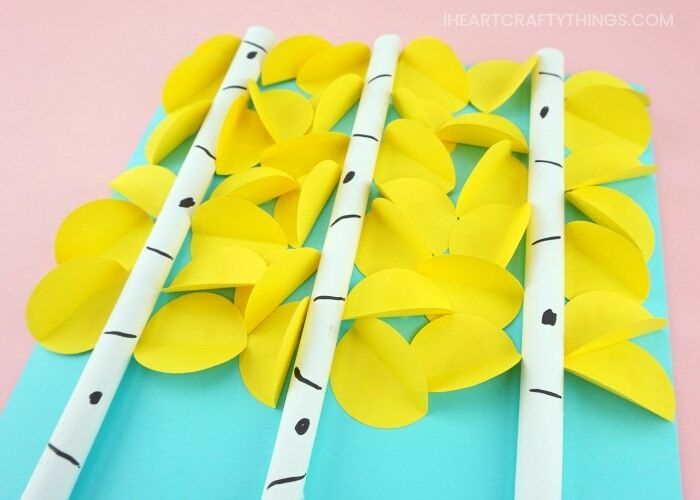 Glue the circles facing different directions all over the tree and with some more open and some closed to add extra depth and dimension to your paper aspen tree art project. Your paper aspen tree art project is complete! You will love how both the trunks and leaves pop off the page giving this gorgeous aspen tree art project a three dimensional effect. The bright yellow leaves against the white trees adds another beautiful effect to this fall art project. Here is another creative way to use paper to create fall leaves. The circle leaves add great dimension to this gorgeous fall tree paper craft. Pumpkins are iconic during the fall season. Use black glue and watercolors to create this beautiful black glue pumpkin art project. We love crafting owls during the fall season. Here is a simple way to turn newspaper into a colorful owl craft. Mix things up this fall season by using clay for crafting. These leaf pinch pots are easy to make and are super colorful!